This class is very different from the traditional running stitch method of quilting, and I think gives much better results. I begin as if you are new to the topic, and together we explore the world of poke-pull (or stab stitch) quilting. I will teach you how poke-pull quilting allows you to make quilting stitches that are straight and even, and look the same on the front of the quilt as they do on the back. No more calluses, no more sore fingers, and no need for a thimble, poke-pull quilting is especially good for those with arthritis, carpal tunnel, or limited flexibility due to mastectomies. Learn how to transfer the design onto your quilt top, how to prepare your layers for quilting, and how to do a truly lovely quilting stitch. NOTE: For a follow-up on this class, see Refining Your Stab Stitch below. 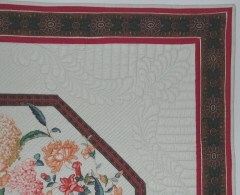 Don't be limited only to quilting stencils, patterns in books, or those dreaded words 'quilt as desired'. Learn how to draft your own quilting designs that fit the spaces you need to fill. Elegant feathered wreaths, border designs, and corner motifs that flow smoothly around the corners are all covered in this class. There is no stitching in this workshop. 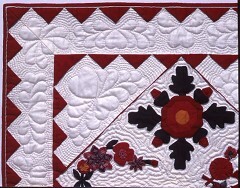 It is a day of learning to draft patterns that can be used for hand or machine quilting. Proficiency: All levels. No prior drawing skills are required. Learn how to design feathered wreaths, borders, lattices, and corner motifs. If you have taken my Mastering Hand Quilting class and learned my method of stab stitching, this class may be just what you are looking for. Now that you have had a chance to try the technique, do you need guidance refining your stitches? Do you need some hands-on assistance tweaking your technique? This is your chance. Bring along your quilting and what you have questions on, and we will work on it together. Learn more tips on using tape to assist in marking, how to measure for placement of lines of stitching, hints on traveling from one area to another, working with colored thread, how to turn corners, and more. Refine your stab stitching in this half day workshop. Quilting transforms the quilt. You spent hours picking colors, choosing fabrics, and constructing the quilt top. The choice of a quilting pattern deserves the same care. This discussion course helps you to decide what type of quilting best enhances your quilt, whether by hand or machine, traditional or contemporary. Students are encouraged to bring quilt tops they'd like help with.